This is my last morning here in China for this trip. And it’s a beautiful day in Shanghai. Yesterday after two really good meetings in the city we headed to Wuxi (pronounced wushi) by fast train. Traveling at roughly 180MPH (just over 300KM/hour) we raced through the suburbs of Shanghai and then the fields and country between the two cities. The roughly 90 mile trip took about a half hour. The cost for a first class ticket was 100RNB – about U.S. $ 7.00 each way. My new friend Yufu made all the arrangements. Between he and Elizabeth they managed to get us not only in but seated at the VIP table at a Chinese banquet. We were at a conference – the 2nd Chinese (Wuxi) Renewable Energy Conference Solar Power Exhibition. http://www.crecexpo.com. The conference is to start today and I regret that I had to leave and head back as attending it (and we were implored to do so) would have been both fascinating and a great learning experience. It’s an initiative that is at the top of mind for Chinese and Americans alike. Before I really knew what was happening I was sitting in a chair with my name next to it in VIP area shaking hands with the deputy mayor of Wuxi (a city of 4 million people with another 1MM in the nearby area) and listening to the mayor (thankfully it was translated) another new friend William Allen who is Chairman of the Los Angeles County Economic Development Corporation. I had the pleasure of sitting next to Mr. Allen at dinner and it turns out we were classmates at USC. As I sat and listened to the proceedings and then participated in my first formal Chinese banquet all I could think of was ‘how the heck did I get here?’ I met many, many, people and handed out and received a plethora of business cards. I now have a host of new contacts in China and in the United States and all due to the generous nature of a Chinese friend whom I’ve only known a short t time (I met Yufu in Los Angeles about a month ago). During the Cultural Revolution in China (1966-76) what photos Americans like me saw were pictures of Chinese people all dressed the same, looking dour and even unhappy. In meeting Chinese people here in Shanghai in Beijing and in Wuxi I found them to be warm, helpful, and truly concerned about me and the experience I was having while in China. So many people wanted to meet me and find out what I did, why I was there, and what I thought of China. Well it’s obvious that I love China isn’t it? I’m heading home now but I am convinced that there is a great opportunity for our company to help Chinese companies in the U.S.A. But the other side is that I can’t wait to get back here and meet more people and have more experiences in this wonderful and ascending country. Zai jian for now. My next post will be from the other side of the globe. How cool is that? This entry was posted in Customer Experiences, Living in the World Today and tagged Chinese people, Cultural Revoluton, fast trains, fast trains in China, Renewable Energy in China, Solar Power exhibition, Wuxi. Bookmark the permalink. 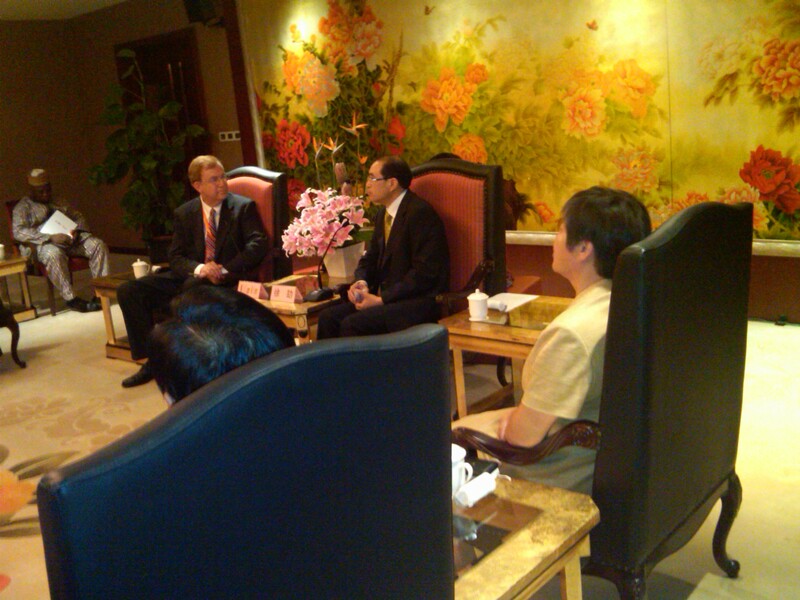 Dr. K – I enjoyed reading about your recent trip to China. The area where we have our production facility in Miami has become a “high end” dollar store retail complex that is mostly owned and run by several Chinese folks. I often wonder in these tough economic times if we should open up a few thousand sf of retail and sell imported dollar store type items. We are genuinely analyzing this option – possibly with an wholesale importer of pottery and baskets. Our neighbors are bringing in containers daily, turning inventory and buying up available space in our complex like its Monopoly. Thanks Scott. It’s true that the Chinese have traditionally been players in the low cost, low value products area. But that business is slowly moving away from China as their standard of living ticks upward and countries like Vietnam and Bangladesh are producing those inexpensive items to a greater and greater degree. Still pottery and baskets are a good area and not necesarily always low end. Furniture is another area of interest. Good luck and look forward to reconnecting.